NOT A NEW LAW ENFORCEMENT SQUAD, based on the ATF*, nor a slogan for the lifestyle of a chain-smoking athlete father, but examples of items seized in and around Manchester both legally and illegally today. 16000 ampoules of anabolic steroids, worth �,000, were being carried by four men travelling from Pakistan and were seized by customs officers at Manchester Airport - the drugs were destined for the black market in the north west. The cigarettes story was reported this morning on the new Macclesfield radio station Silk FM, 106.9, but I didn't come across it anywhere else. I saw the Pampers report on BBC local Teletext (pages 160 -170). This is how Winter Hill looked last week - an appropriate name in view of the current bout of unsettled weather - then as now a mixture of clouds and sunshine. 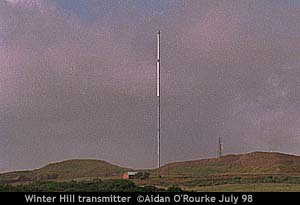 I remember tuning in to the Winter Hill transmitter on our old Murphy 405 lines black and white television set, with a pop-up lid. Soon this transmitter will be broadcasting digital television to the north west. Viewers will need a set top box to decode the scores of new channels. Maybe some day it will be broadcasting Eyewitness in Manchester. IT'S A TYPICAL BRITISH SUMMER, they say - that's why so many people like to go abroad on holiday. BBC Northwest Tonight reports that Manchester Airport is doing a roaring trade, while short-stay holidays in Manchester are down 60%. It's all being caused by an Atlantic depression, causing people on land to suffer from something similar. And Diane Oxberry's weather forecast offered little cause for cheer: A drop in wind and clearer skies tonight, to make way later tomorrow for: more showers. Current EWM temperature 56/13. NEGOTIATIONS HAVE BEEN CONTINUING to secure the go-ahead for an exciting new stadium for the 2002 Commonwealth Games. The �m stadium would then become the new home of Manchester City Football Club. The Government announced today that they would provide cash to help make the scheme happen. Currently, the site in Bradford, dubbed Eastlands, is lying empty. Leader of Manchester City Council, Richard Leese commented favourably on the plans today, but stressed he wanted the stadium to have a viable future after the games. Today, I visited the Town Hall (pictured above) to interview and photograph the very affable Councillor Richard Leese, and also the sharp-tongued Councillor Pat Karney, Chairman of the City Centre committee. Pictures and data will be appearing on this page and in Manchester People next week and the week after. A fire engine in Moston and a lorry in Longsight were involved in serious crashes within hours of each other. In the fire engine accident, firefighter John Ashton almost had to have one leg amputated, but surgeons at North Manchester General Hospital, managed to save it. The vehicle crashed into a betting shop on Moston Lane after it had been called out by a hoax 999 caller. Around a third of 999 calls in Manchester are made by hoaxers, and cost the Greater Manchester Fire Service a huge amount in lost time and money. The lorry accident in Longsight badly damaged a building near the junction with Slade Lane. Traffic had to be diverted off the already heavily congested A6 to allow demolition work. I passed by there this afternoon and took this composite photo, made by combining eight 320x240 pictures - The two locals on their way to the pub couldn't resist posing for the camera! Traffic was only being allowed to go southbound. The A6 Manchester to Stockport "corridor" (a word I seem to hear used a lot at the moment) is one I know from my earliest childhood and is one of the busiest in the conurbation. But soon, buses will have priority at traffic lights along Stockport Road, thanks to a device fitted to the bus. I still think they should bring back old fashioned rear platform buses and conductors. I'd like to be able to use my old school bus pass too, but I don't think they'd accept it now! YES, it definitely felt like July today, early clouds parted to reveal sunny skies similar to those in the photo of the Town Hall above, which I took earlier this week. I'm still waiting for a completely cloudless sky - how much longer? Current EWM temperature tonight 60/15 degrees. Fifty years ago, the temperature was cooler - around 55 degrees. Aneurin Bevan launched the NHS at Park Hospital Davyhulme, and a runaway horse was caught on Portland St. Read about it in MANCHESTER EYEWITNESS 1948. Although I've been living in Flensburg for twelve years now and don't intend going back to live in England, I'm proud to tell people I'm a Mancunian. That's partly because nobody ever says, "Manchester? Where's that?" Everybody has heard of Manchester and has a good idea where it is. Manchester is pretty brill, but Flensburg IS better. We've got the Baltic Sea on our door-step (super for sailing), the wonderful forests and arable land of Angeln (that's where we Anglos come from) and the Flensburg sunshine can turn you brown in a jiffy. I'll be coming to Manchester with my girlfriend and my daughter Sunday 9th August. My daughter and my Mum have never met each other and it's bound to be a very moving experience when they finally do. Lots of tears. Keep up the good work, Aidan. As an ex-resident of Germany (West Berlin 79-80) I know what it's like to live in the land where the Angles and the Saxons originated! I'm just very glad that Eyewitness in Manchester is reaching you loud and clear, even in those far northernmost reaches of Flensburg, which people in South Germany think is just a stone's throw from England! By the way, did you see what Anthony H Wilson had to say about Germans in Manchester? "Tschüss, mach's jut, wa!" -typical Berlinerisch for "tarrah, 'ave a good time"
TALENT, ACADEMIC AND OTHERWISE was much in evidence today as I walked along Oxford Road, past Manchester University - There was hustle and bustle outside the arched entrance the main buildings, designed by Alfred Waterhouse and opened 111 years ago. 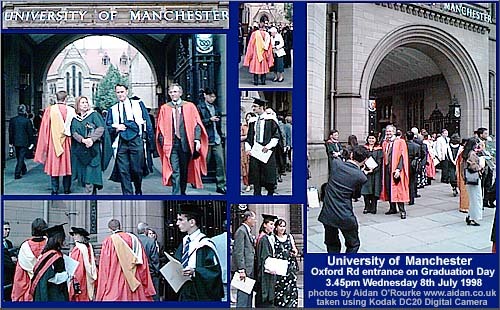 To receive their degree certificates, the "Class of '98" were done up to in their best suits and dresses, rounded off with variously coloured cloaks and caps. Photographers were out in force to capture the event, and I must say many of the female graduands managed to look very glamorous in their medieval-style over-gowns. But this week's graduation ceremonies could also become a scene of protest - lecturers could picket the main graduation event at the Bridgewater Hall in protest against possible job cuts - I saw a demonstration in All Saints from the window of a bus passing the other day, and will keep my camera poised for more action. And in Tameside, 200 care staff are meeting their union to decide what to do next in their six-month dispute with the private company which used to employ them. When they refused to sign new contracts on less favourable conditions, they were sacked. Tameside Council has intervened, saying they will help the workers find new jobs. AFTER THE BATTERED and bruised face of grandmother Madge-La Rose appeared in the newspapers and on TV, there was an overwhelming response. She had been brutally attacked by two young intruders a few days ago. Reward money was put up, and it looks to have had the desired effect: two 14 year olds from Yorkshire have now been charged with attempted murder. It's a tribute to the power of photography that the public were mobilised to help the police - The photo was truly shocking - but she appears to be making a good recovery, and has received a lot of support from well-wishers. The two defendants, "who cannot be named for legal reasons", will appear in court soon. In Dubai, Sheikh Mohammed decreed that young troublemakers should have their pictures published on the front page of the Gulf News. The "Gallery of Shame" seemed to work. Perhaps something like that is needed here. OVERCAST SKIES with mild temperatures - this was the weather in Manchester today. I'm waiting patiently for a spell of clear blue skies to take some nice photos for you, but how much longer? Current EWM temperature 58/14. I CAN'T SEEM to go more than a month or so without changing the design of the page - and I've gone and done it again. But there is a reason - no, not because the Evening News changed their masthead - it's because many readers out there are printing out this page to give to friends and relatives who aren't on the Internet. The black column on the left was very wasteful of ink, so I made a separate printing page. Chatting yesterday to visiting Eyewitness in Manchester reader Graham Booth, from Swinton, resident in Sweden, I decided to ditch the left hand column entirely. This format looks better on a 640 by 480 monitor, which many of your out there are still using. I am now living in Scottsdale Arizona and have in the USA since 1973. I cannot tell you how much I enjoy signing in and reading the news from Manchester each day, and the pictures are great. I moved to the United States in April 1973. I lived in Northenden, Manchester most of my life, I print out your pages ant take them home to let my mother see as she moved here in 1981. Keep up the good work, I am sure you make alot of people very happy. Thanks very much indeed - I love receiving messages like yours! More please! 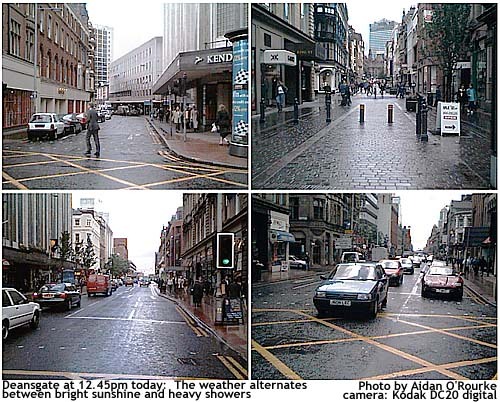 Hi Aidan , have just had my regular fix of Manchester Online. It is my first stop to check out what is happening , whether it is cold, wet or sunny. I was pleased to see the sunny photo's but I notice also the cardigans and jumpers being worn. I am cold here in winter. It is currently sunny and 18c. Can't wait for summer. I have Mum and Dad ( born Swinton and Salford ) look at your site. They are 90 and 93 yrs old and have been in Australia 44 years. You trigger so many memories of the old days . You put in a great deal of effort into your site and it shows. You've got me confused - Winter in July, 18 degrees cold! Australia is a huge contrast with Manchester. I've never been there but hope to go some time soon. IT'S SUNNY in Manchester this afternoon - how's that for an earth shattering news item! But not totally clear blue skies and a bit windy - still, it feels summery, that's the important thing! Current EWM temperature 67/19. More news items, and a new look page, coming soon. In the meantime, here's the long-awaited Anthony H Wilson feature. Please e-mail with your comments and reactions. 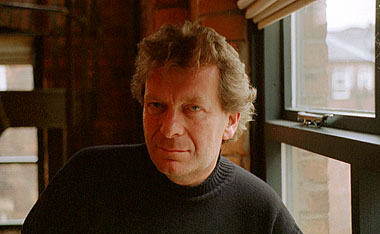 One of the most famous and influential of Manchester people, Anthony H Wilson is synonymous with the city's pre-eminence in music, media and nightlife. In his childhood he grew up with rock 'n roll and the Beatles, and during a remarkable 27 year media career, he experienced two more seismic movements in popular music. According to his "13 year cycle" theory he hopes soon to witness a fifth! Anthony Wilson founded the famous Hacienda night club (now closed) and was one of the five co-founders of Factory records - a label that set the trend not only in music, but also by pioneering a minimalist style of graphic and interior design. Factory's stark northern industrial chic was the counterpoint to London, and helped turn Manchester into (arguably) the music and night club capital of the world. What makes Manchester unique, particularly in music? 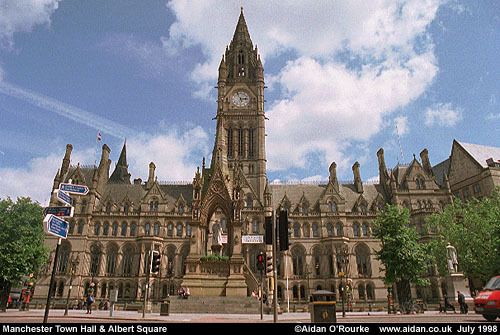 Which places in Manchester do you like to go? Atlas is our favourite cafe bar, it's our local, the food's of a high standard and Jenny's brilliant. Also Coco Too's Italian restaurant, on Whitworth St.
See EXCERPTS from the interview.